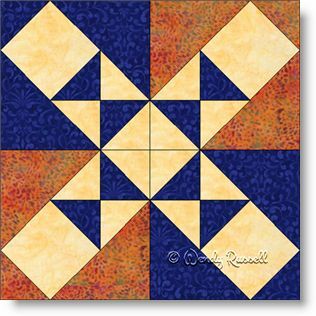 The Cat and Mouse quilt block is a four patch using half square triangle cut pieces individually rather than as two pieces to make a square. Secondly, this block makes use of the square in the square patch, but again, not in the traditional manner -- but it does require the cutting of the patch as such. This all sounds very complicated, but the making of this block is relatively simple, so have no fear. The illustrated sample quilts show how versatile this quilt block is in the resultant quilt that you choose to make.